The record of employment creation in IT and IT enabled services (ITeS) has been quite abysmal in India. Speaking at the Digital Haryana Summit in September 2017, the minster for electronics and information technology, Ravi Shankar Pratap Singh said that “the country’s digital economy is growing fast and by 2020 it is expected to provide job opportunities to about 50 to 70 lakh youth”. This pipe dream let lose by the minister may make one think that the automation and digitalisation process may create new opportunities to tap the so-called ‘demographic dividend’ of the country. This claim has been made despite the data generated by several surveys which showed that there was a likelihood of layoffs as a result of digitalisation. In May 2017 when several industry reports claimed a slowdown in job creation, the central government denied the same, claiming that 2.5 to 3 million jobs will be created in the sector by 2025 or roughly about 4 million jobs in the next seven years. This mirage hides the problems of employment that have plagued the development of the Modi government and disregards global outlooks for workers in the IT Sector. 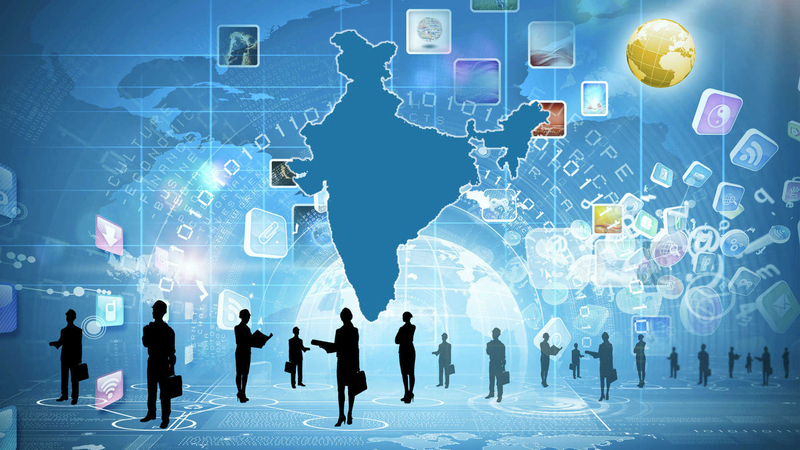 If the government of India is to be believed, the ICT industry is a 1 trillion business opportunity with growth prospects that will create jobs for the youth. However the latest World Investment Report, 2017 of the UNCTAD shows that global dynamics of the ICT industry and IT enabled services is not so optimistic. As the report states: “The digital economy is fundamentally changing the way firms produce and market goods and services across borders. Digital multinationals can communicate with and sell to customers overseas without the need for much physical investment in foreign markets. Their economic impact on host countries is thus more ethereal and less directly visible in productive capacity generation and job creation. And, today, the digital economy is no longer just about the technology sector and digital firms, it is increasingly about the digitalisation of supply chains across all sectors of the global economy”. The report shows that there has been a considerable decrease in FDI inflows in the developing and transition economies especially due to the digitisation of services. Furthermore, the weight of services sector increased considerably with one third of the top 100 multinationals cornering most of the benefits. This assessment is backed up by the fact that employment in multinational enterprises controlling digital businesses has been relatively stagnant as far as job creation is concerned. This factor has to be seen in the context of the overall increasing unemployment in the world within the last year. According to the World Economic and Social Outlook 2017 published by the International Labour Organisation more than 3.4 million people have been added to the worldwide unemployed workforce. This number is expected to rise to 3.6 million in emerging and transition economies like India. In contrast, unemployment is expected to come down in developed countries where the trend seems to be towards reshoring of jobs, especially in the wake of digitalisation. Hence, it is not surprising that developed countries are pushing for the digitisation and automation of services as it brings down their labour costs and hence their cost of production. This factor is likely to influence the growing inequities between the developed world and the rest since the process of capitalist accumulation is now dependent on investments in high end technologies and labour. In this sense the developing countries, emerging and transition economies like India are set to lose their advantage that is based on the existence of large labour reserves. In this sense, the popular ‘demographic dividend’ argument may in fact be not applicable with the push towards digital India. Seen in this context, the record of employment creation in IT and IT enabled services (ITeS) has been quite abysmal in India. The recent Quarterly Employment reports reveal that there was a net addition of about 2 lakh jobs between March 2014 and January 2017 i.e., approximately 73,000 jobs per year. This is a far cry from rhetoric propagated by government and the NASSCOM that they will create 50-70 lakh jobs in the next seven years. Further, it is also telling that the IT industry’s own assessments are very bleak as far as employment opportunities are concerned. For example a report by McKinsey and Company to the NASSCOM states that there are likely to be annual job cuts of 1.75 to 3 lakhs per year in the next three years in the ICT and IT enabled services because of automation. The report also states that it will be a challenge for the industry to retain 50-60 per cent of its employment. The other important claim made about the digital India programme is that it will lead to the expansion of formal employment opportunities, especially for the youth in the informal sector. It is argued that this formality is largely linked to the transparency of contracts. The Quarterly Employment Surveys also record an increase in contract workers and a decline in casual workers within the IT/BPO sector. However the presence of a contract does not necessarily imply decent working conditions. Available secondary literature shows that most IT/BPO workers have fairly difficult conditions of work and face a huge threat of job insecurity. This insecurity is only increasing with the progression of digitisation. It is therefore not surprising that many in the IT /ITes sectors also do freelancing along with their full time jobs. However the nature of this multiple job profile is gendered in character as the freelancing is largely done by men. It can be surmised from case studies inside and outside India that additional burden of care work does not allow women to take up any independent work. Further it has also been observed that women are largely integrated into the lower end of the IT/ITeS sector with most of them performing customer service jobs. These jobs are more general in character as compared with male dominated positions which are far more specialised and have higher wages. But this is not the only difference between the patterns and conditions of work of men and women. The survey data of 2016 shows that the IT/ITeS sector also has the highest gender-wage gap. The average gender pay gap of 38.2 per cent is one of the widest observed within all services and industries. Women earn INR 142.5 less per hour than men. This means that men gain another 38.2 per cent more of their salary. Further, female supervisors are paid INR 181.6 (59.3 per cent) less than male supervisors, non-supervisors INR 49.4 (23.5 per cent) less. This means, the pay gap more than doubles for women in higher positions. Despite these structural differences, surveys also show that the commonality within the workforce is that experience and education play a very small role in determining the level of wages. This clearly exhibits a trait of informality within the sector. It has been argued by the neo-liberal ideologues that the major advantage of the IT/ITeS sector is that it provides flexible working hours. This provides a degree of ‘autonomy’ to the worker. However, recent ILO surveys show that even freelance workers have little control over their own time because of the nature of the contracts within the sector. Further even the flexibility of timings is also largely decided by the company with little control to the worker. This method of control, even though work spaces may be decentralised, has been termed as ‘digital Taylorism’. Such a labour regime requires a discipline that is determined by the technology and the international market for services. Most call centres train their workers in accents, behaviour and a host of other aspects that are essential to the accumulation process in the digital economy. In fact studies show that this garb of ‘flexibility’ has in fact led to longer working hours because the digital economy is in fact based on stringent targets and performance based evaluation that has led to layoffs in several companies. Unions of IT workers have even started campaigns to combat the layoffs. Given these factors, the dream of Digital India will not improve the quality or scale of employment unless it is backed up by the strict implementation of labour laws.